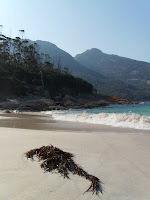 Tasmania: an island of visual delight, geological wonder and notable gastronomy. Seafood is particularly renowned, with the east coast especially providing the opportunity to sample many of the ocean's finest as 'catch of the day'. Providing of course, in the smaller towns, that you've sat down to order by 7:30pm, otherwise you may find doors barred and staff pointedly ignoring the image of your wan, hungry face gazing alternately at the menu or through the window, imagining what delights you're missing out on! 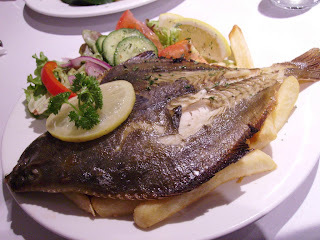 One such night, in St Helens, we were left with the Bayside Inn as our only dining option. They provide bistro style dining, and while I wasn't expecting much I was firstly impressed that they were still serving (unlike everywhere else in town that advertised 'Kitchen Open until 8pm' but really meant about 7:40) and that the bartender took time out from his TasKeno duties to give us good information about the seafood options. He spoke at length about the Fish of the Day (trevalla) and explained that a poor scallop season meant what they had to offer 'wasn't local' (it was from Triabunna, less than 200 km away) and had been frozen. Concerned that, despite assurances to the contrary, our last feeding option within many kilometres could close at any moment, we both went simply for the battered flathead and chips (with vegies from the salad bar). 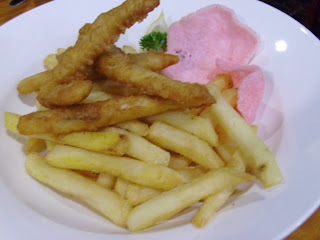 They certainly do love their seafood here: so much so even some of the chips were of the prawn variety! View Point in Swansea is a delightful restaurant. Like many other buildings in the town it's perched above Oyster Bay with views across to the Hazards of Freycinet. Its interior decor is distinctly maritime, but drops anchor just short of kitsch. 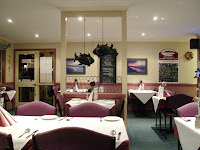 The food is not extraordinary, but most importantly it focusses on local produce, plus it's reasonably priced. The specials board posed the linguistic problem of how to make a plural of 'Fish of the Day', as there were in fact three: prawn cutlets, battered flathead or whole flounder. My choice was the latter. It was all one could wish for from a FotD dish, really. Slices of flesh fell easily away from the bone, and I was left with a satisfying whole-fish skeleton at the end of the meal. Any guilt from my second night of chips was assuaged by the 10 km walk I'd done that day and the contrastingly light piscine meat and accompanying salad. 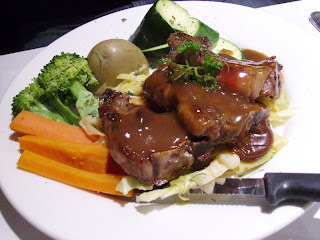 Ordering was easy for SG: Tasmanian lamb with demi glace sauce, which came with sauerkraut and without the promised mint jelly, plus veg. The sauerkraut was a surprise and the demi glace more of a gravy, but the meat was both wonderful and plentiful. Both meals were happily accompanied by a Tamar Valley sav blanc. 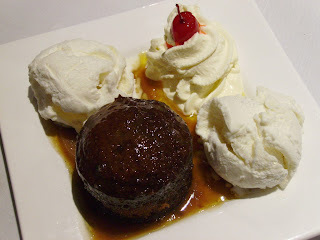 Dessert - sticky date pudding - suited our desire and represented the restaurant perfectly. The pudding was sweet and spongy and the butterscoth sauce thick and buttery. The ice cream was certainly garden variety vanilla and the cream was definitely squirted onto the plate (with a maraschino cherry atop, no less! ); but altogether the dish was warming, pleasing and hit just the right spot. The best seafood moment of all, however, deserves its own post.